A closeboarded fence consists of posts, horizontal arris rails and overlapping featheredge boarding to create a strong and durable fence. It can also have a trellis at the top, as depicted. It's easy to space posts at custom distances, making going round objects (eg large trees) and curved fences eaiser than with Kent lap or Closeboard panels. Either Arris or Cant rails can be used. Cant is rectangular rail with a sloped top to shed water, whereas arris is triangular. Metal arris rail brackets or mortice adaptors can be used to fix the rails to the posts. The top arris or cant should be fixed well below the top of the fence for maximum board rigidity, and to make climbing over the fence less easy. 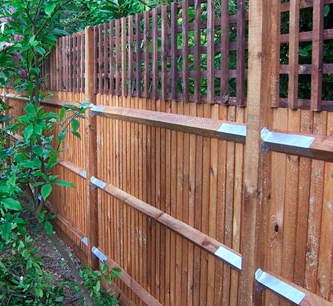 Featheredge boards require a minimum overlap of about 10-15mm, as they can shrink due to climate. Feather edge boards should be fixed with a nail in the centre, if 2 nails are used into each rail they can split as the timber shrinks. A string line can be used to keep the tops of the boards in line when fitting. Top tip: Cut a small 'L' shaped piece of timber for spacing the boards at the same distance. This is much quicker than measuring each one with a tape measure!